A performance by renowned Kathak dance duo Vidha and Abhimanyu Lall capped a two-month long festival, which consisted of performances in 10 Russian cities. The curtains came down on the Festival of Indian Culture in Russia on Wednesday December 11 with a performance by Kathak dance duo Vidha and Abhimanyu Lall at Moscow’s Palace on Yauza. The well-known duo also performed in Kislovodsk and Rostov-on-Don before coming to the Russian capital for the festival-closer. A total of 15 performances were staged during the festival, which began on September 10. The performances were spread across Russia and Indian artists performed in Moscow, St Petersburg, Veliky Novgorod, Ufa, Kazan, Vladimir, Yaroslavl, Kislovdsk, Rostov-on-Don and Tomsk. Six renowned Indian music and dance groups comprising of more than 50 artistes took part in the festival, which was jointly coordinated by the Jawaharlal Nehru Cultural Centre and the Russian State Concert Company Sodruzhestvo. The highlight of the festival was a series of concerts by Ustad Shujaat Husain Khan, one of the greatest North Indian classical musicians of his generation. 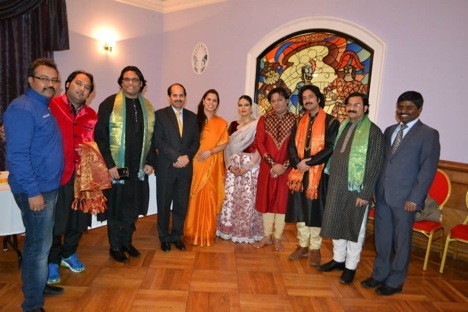 Ustad Hussain performed in Ufa, Kazan and the Russian capital. The festival follows in the footsteps of the Year of Russian culture in India in 2008 and the Year of Indian culture in Russia in 2009. In 2014, a festival of Russian Culture will be held in India. It is understood that the performances of the Russian artists will not be restricted to cities like Delhi and Mumbai and will be held in tier-2 cities as well. The Indian Embassy’s Jawaharlal Nehru Cultural Centre is organising a Hindi film festival this weekend in Moscow to mark the 100years of Indian Cinema. Moscow’s Illuzion Theatre (Kotelnicheckaya Naberzhnaya, 1/15) will be screening classical and contemporary Indian films such as Awaara, Pushpak, Swades and Munnabhai MBBS. Invitations for the film screenings can be obtained from the Nehru cultural centre.